Colin Kaepernick and the 49ers gave their fans a long-awaited gift on Christmas Eve: a rousing, comeback win over the Los Angeles Rams to snap their 13-game losing streak. The quarterback’s two touchdown passes, his 13-yard-run for a third touchdown and especially his bold and inventive two-point play for the lead reminded us what a special athlete he is. Kap doesn’t get all the credit for the 22-21 victory, of course. Receivers Carlos Hyde and Rod Streater caught touchdown passes. The defense sacked Rams’ quarterback Jared Goff four times and intercepted him twice. Down by a point, Coach Chip Kelly called for the gutsy, do-or-die, two-point play with seconds remaining in the fourth quarter. But neither should the quarterback get all the blame for the team’s nightmarish season and team-record losing streak that dates back to Sept. 18. Kap didn’t start and scarcely played in the first five games of the year. 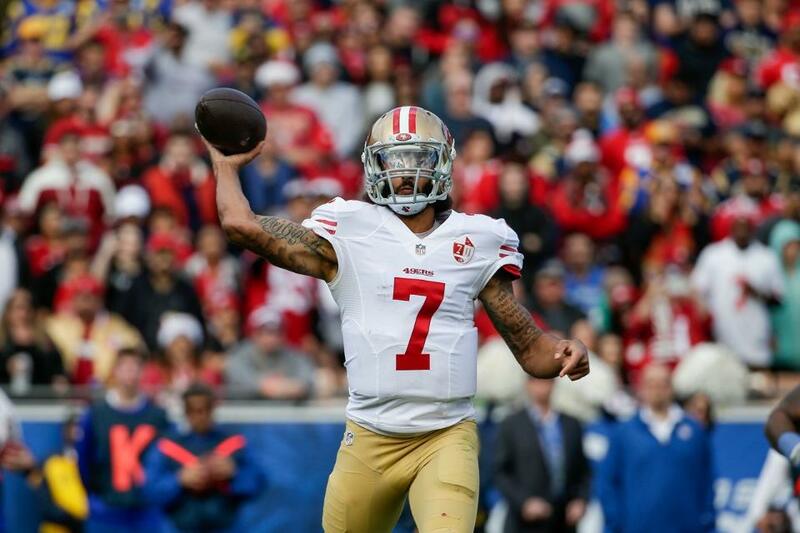 After he reclaimed his starting position in the sixth game against Buffalo Bills, Kap earned a respectable 88.2 quarterback rating, playing more than well enough to win several more games if he’d had better support from his teammates. It’s not easy to follow Hall of Famers like Joe Montana and Steve Young and fans have held the Turlock native to unrealistic if not impossible standards. That began when he broke through as a starter in 2012 and quickly broke records by running for 181 yards in the playoffs against the Green Bay Packers. Though he failed to win the Super Bowl that year, he threw and ran the 49ers within five yards of a Lombardi Trophy. A year later when the Niners lost to the Seattle Seahawks in the NFC championship game, Kap rallied the Niners for two earlier playoff wins and took San Francisco within one play of a second straight Super Bowl appearance. Public scrutiny of Kaepernick greatly intensified this season when the public became aware of his kneeling national anthem protests. His critical stance rubbed many wrong especially in conservative areas like his hometown, leading to scalding criticism, hate mail and death threats. Kap even lost some of his liberal supporters when he revealed that he didn’t vote in the past election. But neither did millions of other eligible citizens, and no one should fault him for trying to bring attention to serious issues like racial inequality and police misconduct. How many of his critics have donated $1 million to the underprivileged and created a youth empowerment program, as he has done? He’s not perfect as a player or a man, but we should never have expected him to be. In some ways the Christmas Eve game meant nothing. San Francisco’s win won’t help the Niners reach the playoffs, or earn a winning record, or bring the franchise back to respectability overnight. But the players’ joyful celebration showed the win meant much to them as a validation of their effort and persistence in the face of 13 weeks of misery. Kaepernick especially deserved it. After this season, he may stay with San Francisco, or he may go elsewhere. If he leaves, Saturday’s win against the Rams could be his 49ers swan song. Regardless of what follows, Turlock should remember all he’s achieved, both on and off the field, and be proud of its accomplished native son.